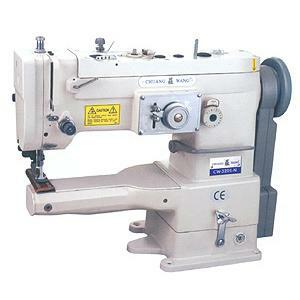 Sewing by Stitch Type CYLINDER BED LOWER FEED ZIG-ZAG MACHINE Industrial Sewing - SOUTHWEST SEWING MACHINES, LLC. 1. New gear designed can adjust the gap of large hook. 2. Graduated dial for feed adjustment and reverse feed with spring return. 3. A new sealed ridge improvement which prevent oil leaking completely. 4. Automatic high speed oil reservoir lubrication system. 5. Suitable for sewing concave, convex, spheroidal, tubular, bowl-like objects. 6. Hemming and piping attachments can be filted for sewing various edges.